ITTN’s News & Features Editor Neil Steedman checked out the Business Class service on Turkish Airlines from Bangkok to Dublin. From Istanbul Turkish Airlines currently serves eight destinations in six countries in South-East Asia, including daily flights to Thailand’s capital, Bangkok – and plans to add Bali in 2018. Since July this year Turkish Airlines has also been flying to Phuket four times a week (on Monday, Thursday, Saturday and Sunday) so you can now fly to Bangkok and return from Phuket, or vice versa. The airline currently has 329 aircraft with an average age of seven years, making it one of the youngest fleets in Europe, and with 170 aircraft on order the fleet will increase to almost 500 aircraft by 2023. At Bangkok’s Suvarnabhumi Airport I was allowed to check in five hours before my flight, and the Business Class baggage allowance is two bags, each a maximum of 32kg. I then went straight through the Premium Lane for Immigration and had a choice of a Thai Airways International or Eva Air lounge, both Star Alliance members along with Turkish Airlines. Thai was the obvious choice, on Level 3 in the E gates section, and the Royal Silk lounge (on the left) rather than the Royal Orchid lounge (on the right) was recommended because the first serves hot food. Turkish Airlines operates this sector using a B777-300ER with a 2x3x2 configuration in Business Class and 3x3x3 in Economy Class. The 49 flat-bed Business Class seats are 22” wide and have a 78” pitch and 177 degree recline. I was welcomed onboard by a Do&Co Flying Chef (they are real chefs) offering juices and taking my dinner and breakfast orders, while cabin crew provided a hot towel and pre-dinner drinks and nuts. There is a sliding privacy screen between seats, a large storage locker, a firm extra-wide head cushion, and bedding is provided by cabin crew, along with a Bentley amenity kit and high-quality Denon noise-cancelling headphones. The socket for the headphones is hard to find (it’s low down in the side pocket) and even when you know this it’s not that easy to plug in – more by feel than sight. There is free wi-fi and the inflight entertainment digital system, The Planet, with an individual touch-screen and remote control device, offers a wide variety of movies (340), TV series and documentaries (410), music albums (760) and games (20). From a choice of three starters, three mains and six desserts, I dined on Creamy Cauliflower Soup and Wild Salmon Tartare & Fennel Salad, Penn with Wild Mushrooms and Parmesan, and Mango Cheesecake – and awarded the meal 10 out of 10. After a comfortable sleep, breakfast was almost as good with Orange Juice, Yoghurt, Honey, Fried Free-Range Eggs in Butter, and Hot Chocolate. On arrival (on time) at Istanbul we were bussed to the terminal building. On my four arrivals/departures at this airport, the transfers between terminal and aircraft varied from air-bridge to Business Class bus to One-Class bus, perhaps depending on what gates are available, or not, at any given time. In the past I have commented unfavourably on the security check arrangements for transiting Business Class passengers at Istanbul Atatürk Airport, but on this occasion I found that these have improved significantly. One of the many pleasures in travelling Business Class through this airport with Turkish Airlines is the 24-hour Business Lounge near departure gate 220, which has to be among the best lounges in the world. The extensive two-level facility includes a Chinese food buffet station catered by Do&Co – among many others, a dedicated coffee bar, storage lockers, a library, newsroom, movie theatre, shower suites, day rooms, olive tree garden – even a golf driving machine, snooker table, children’s room with video games, and a popcorn machine. You can access the lounge directly using your boarding pass or Star Alliance membership card at a turnstile, but there is also a reception desk for any queries. However, the lounge is very busy (downstairs perhaps less so), so I look forward to seeing the Turkish Airlines lounge in the Istanbul New Airport (or Third Airport) that is currently under construction in Arnavutköy district on the European side of Istanbul. 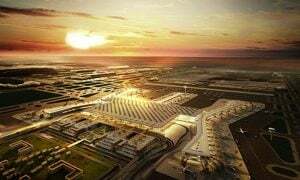 This is planned to be the largest airport in the world, with six runways, 16 taxiways, four terminals interconnected by rail, and with capacity for 150 million passengers per year – extendable to 200 million, and 165 aircraft passenger bridges at all terminals. The airport is now more than 70% completed, with initial operations scheduled to commence by February 2018 and an official inauguration on 29th October 2018. Passengers should bear in mind that the Business Lounge is 10+ minutes walk from gates 700-712, and no departure announcements are made, so you need to watch the clock. The Dublin sector is operated by a narrow-bodied B737-900ER with a 2×2 configuration in Business Class and 3×3 in Economy Class. The 16 Business Class seats are 20” wide and have a 43” pitch and 5”-6” recline – so not the flat-bed seat enjoyed on the Istanbul sector. However, the Flying Chef was again onboard with a welcome lemonade and was ready to take my breakfast order (yes, another one). That day’s special, “comb honey from Erzincan, ‘kaymak’ clotted cream from Afyon, and Anatolian-style spicy pepper and tomato spread with oven-fresh breadbasket” was delicious and was followed by Scrambled Eggs, Grilled Tomato and Green Pepper or ‘Gözleme’ Grilled Flat Pastry Stuffed with White Cheese and Leaf Spinach – and to finish, Regional Turkish Cheeses or Dried Figs and Apricots (or, in my case, both). Now that’s a great way to end a long-haul flight!